Madhavi graduated in Physical Therapy in 2002. After graduating, she worked at the Vijaya Hospital and her clinical experience included inpatient and outpatient orthopedic, cardio-pulmonary, and neuro rehabilitation.She enjoys treating a wide variety of orthopedic conditions that includes ankle/foot, elbow, hip, sacroiliac and cervical spine dysfunctions, shoulder and knee problems, post-op conditions and balance dysfunctions. She has taken courses in vestibular rehabilitation and manual therapy and has had extensive experience in treating vestibular patients. 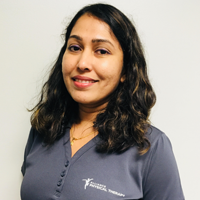 Madhavi plans to complete her certification in dry needling.